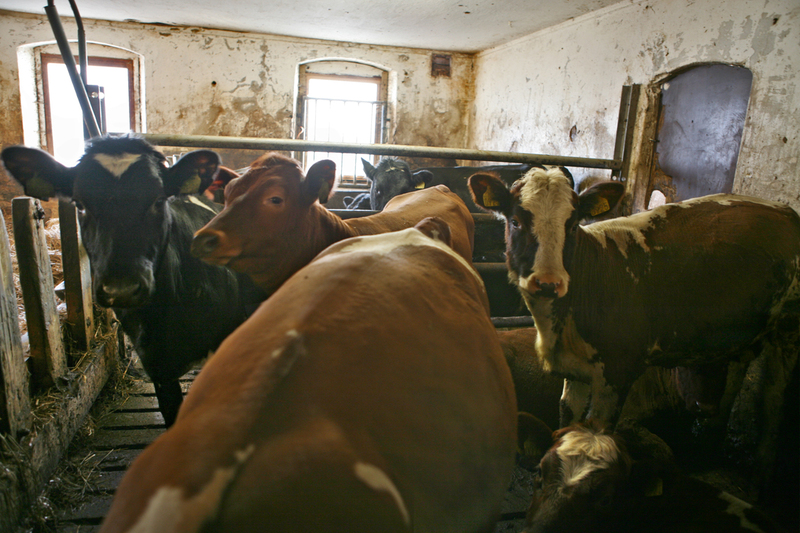 Our neighbour’s cows spend the winter in the cowshed — fjøs, in Norwegian. The cows are obliged to share the space with our horse and some small ponies. They have their own stalls, of course. The horses go outside to graze during the day, but not the cows. I’m not sure why not, though. According to my other neighbour, cows will tolerate subzero temperatures quite happily as long as they have hay and silage to eat while the grass is covered with snow. I love visiting the cows. I do it quite often, because of the horse. They greet me with an enormous MOO, the loudest greeting I get. Occasionally one of them licks my face — hesitantly, at first — with her sandpaper tongue. My wife made a new Chinese friend who, after a few weeks in England, said that one of the things that surprised her was seeing farm animals out of doors. P.S. I know your cowshed as a byre. Oh, I thought they migrated to tropical regions during winter. I know your cowshed as a byre. In Norwegian a bur is a cage (for birds, animals or whatever). It used to mean a house in a farm, originally a sleeping quarter, I think, but extended to mean “storage building”. I don’t think it ever denoted a cowshed. Hence “fadebur” in Danish: a storage for plates and dishes and by extension food. As I just realised – I really should learn more Scandinavian. Our cows ended up spending all year out. They can grow quite a bit of fur when allowed to. Be careful, mein Graf, she’s trying to steal you face and take over the world (as bovines are wont to do). Didn’t you watch the documentary with Nikolaj Bur? Horses too can grow quite a bit of fur if left outside in the winter. Yes, and then they get all hot and sweaty when you bring them inside. But the point is that you don’t bring them inside. I am not familiar with the details of horsekeeping, but I have seen horses left all year in a pasture, even when there was snow, and they were definitely furry in the winter. There are some horses around here that are outside all year. They don’t seem to mind; I think horses really prefer being outside. One night this past summer there was a terrible storm and we took Askur inside; but he couldn’t wait to get out again the next day. My daughter & the woman who has the ponies clip their winter coat short so they don’t get too hot at night when they’re with the cows.